My family didn’t trek cross-country to watch me hug trees. The flipbook version of how I got here, arms flung wide around this giant sequoia, goes like this: Dena and I got married; Ben was born; Sam was born; Ben graduated from high school; we took this trip to hike in Yosemite National Park to put a seal on the era of our family living full-time under the same roof. But then, they never reckoned with how the prospect of the changes imminent with Ben’s departure for college would send a nervous dad seeking reassurance in things that endure. And few living things endure like the giant sequoia. Specifically, this giant sequoia right here, soaring 250 feet above my head, which first unfolded from a seed the size of a pinhead more than 2,500 years ago. I am surprised by the softness of its bark, cool and spongy, despite the tree’s rough-hewn physique. I wonder how many prayers have been offered up to its canopy over the centuries. “Is Dad talking to a tree?” Sam asks Ben, the two of whom have suddenly emerged behind me. “No way,” I say, hastily disengaging myself from the cinnamon-hued trunk. Dena, too, has now appeared from around the sequoia’s massive trunk. “I think it’s sweet,” she says, taking my hand. Yosemite National Park is located in the eastern portion of California and spans the Sierra Nevada mountain range. It’s a land of mountains, granite cliffs, waterfalls, sequoia groves, glaciers, lakes, and streams. Its valley floors lie at just over 2,000 feet of elevation and its tallest mountains top 13,000 feet. Over the last ten million years, its features have been uplifted by plate tectonics, sculpted by retreating glaciers, winnowed by wind and rain. Its two main valleys – Yosemite in the south and Hetch Hetchy in the north – are defined by the courses of the Merced and Tuolumne Rivers. Archeological evidence suggests that humans were in the area as long as 10,000 years ago, and Yosemite Valley was home to the Ahwahneechee people beginning 3,000 years ago. The gold rush of the 1800s introduced white settlers to the area, which rapidly suffered from the effects of heavy prospecting and logging. Thanks in large part to the naturalist John Muir, what is now Yosemite National Park was the first land specifically protected by the federal government when Abraham Lincoln signed the Yosemite Grant in 1864. This would set the precedent for Yellowstone becoming the first National Park eight years later. Yosemite received the proclamation in 1890. Yosemite covers 747,956 acres and is home to some of our country’s most iconic geography: El Capitan, Half Dome, Yosemite Falls, and Glacier Point. Yosemite Valley is the undisputed heart of the park, and as such, is the destination for many of the park’s four million annual visitors. Summertime traffic in the valley and at Glacier Point can be throttling; however, these high-traffic areas comprise less than 1 percent of Yosemite’s area, and one rarely has to venture more than a quarter mile off the main roads to find oneself practically alone in a rugged wilderness. Our trip itinerary covers both the well-trafficked and the more remote areas of the park, although even five days isn’t enough to do more than scratch the surface of everything Yosemite has to offer. Day one, as already noted, is devoted to giant sequoias. Yosemite’s most famous sequoia destination, the Mariposa Grove, is closed for restoration work until sometime in the summer of 2017, so we have come instead to its lesser-known sister, the Nelder Grove, which lies just outside the official park boundary. 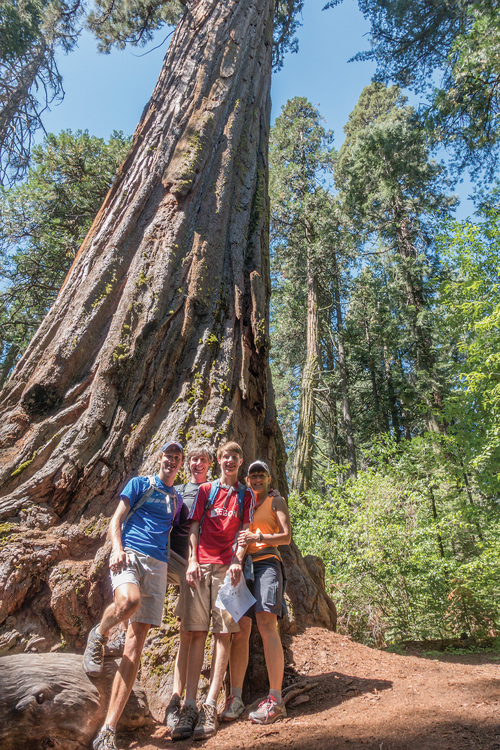 There are a number of hiking routes to and through the Nelder Grove, but we have chosen the longest option, the Graveyard of the Giants trail, in search of coniferous elders such as the Bull Buck Sequoia, the Chimney Tree, and the Old Grandad Tree. It’s a strenuous five-and-a-half miles, and afterwards, tipped off to a local swimming hole, we cool off in the bracing waters of Lewis Creek. 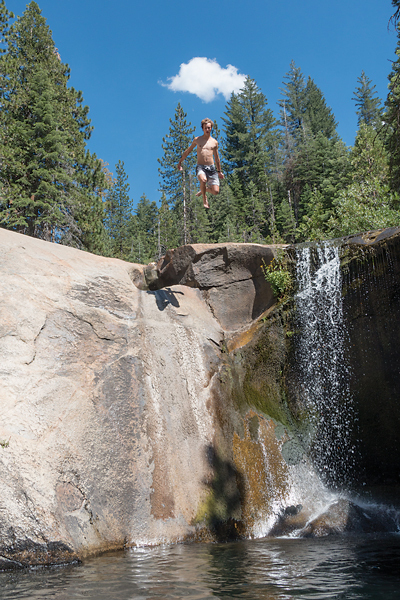 The swimming hole is created by a 25-foot waterfall plunging through a granite rock face, and is deep enough to tempt one to jump from the top of the falls into the water below. below constitute ecstasy, pain, or just exuberant mockery of their old man, who now stands alone, twisting his fingers at the edge. And then, who says grown men aren’t susceptible to peer pressure? I, too, have hurled my body into the empty air. Now, let me tell you something. Twenty-five feet is higher than it seems. The time it takes to reach the water is longer than I thought. It is long enough for me to think about why I just did what I did. It is long enough for me to wonder if hitting the water is going to hurt. It is long enough for me to wonder if I’m going to hit the water at all, or the granite ledge on the side. It is long enough for me to wonder why in the heck it is taking so long, and geez is that spluttering sound the noise the wind makes as it flutters my love handles? I wonder if the … ohmyGodohmyGodohmyGod this water is COLD! Just like that, plunged into the bracing water. Down, down, down, then up, up, up, to the surface, the brilliant California sun breaking a million radiant gems on the surface of the swimming hole. Fingers already numb with cold, I scrabble and flop my way out of the water and warm myself on the sun-baked rock, all ready to receive the adulations of my children about their father’s great fortitude at mastering the swimming hole, but they are already off, dashing back up the rock face to take the plunge again. Day two is our first foray into the park proper, and this is the day we join the crowds, on our way to Glacier Point, a ridge along the south wall of Yosemite Valley famous for its views of the valley and beyond. It’s a slow roll along the two-lane road in the steady traffic. As we near Glacier Point, the road negotiates a number of sharp bends. Around one bend we go, the woods fall away, and out of nowhere, the valley vista opens up across the horizon, and the effect is no less breathtaking than the icy waters of the swimming hole. Over four million people visit Yosemite each year, and 99 percent of them visit only Glacier Point and Yosemite Valley. The vast majority are, like me, jaded city dwellers. In the era of 24-hour breathless news cycles built on shock value, our capacity for amazement has been blunted by our sense of “meh.” But to stand at Glacier Point, with the great granite musculature of the earth flexing across a horizon studded with clouds, is to stand in a place of wonder that nullifies even the most well-honed cynicism. The aptly-named Half Dome anchors the view in which, in a grand sweep, one can take in the Yosemite Canyon and its iconic El Capitan, the Tenaya Canyon, and beyond that, the great highlands with peaks like Cloud’s Rest (named after the stuff of dreams), and finally to the Little Yosemite Valley in the east. From Glacier Point we traverse the nearby Sentinel Dome and drop again into woods, following the Pohono Trail towards Taft Point, noted for its mile-high fissures that extend all the way to the Yosemite Valley floor. As soon as we are on the trail, the people disappear and we are, for the next few miles, alone. As we follow the trail through a high-altitude pine forest, the weather changes, and before we can get to Taft Point, thunder is crackling ominously. Yosemite weather changes with little warning, and the last place we want to be during an electrical storm is on an exposed rock face, so we beat a hasty retreat. Taft Point will have to wait for another visit. 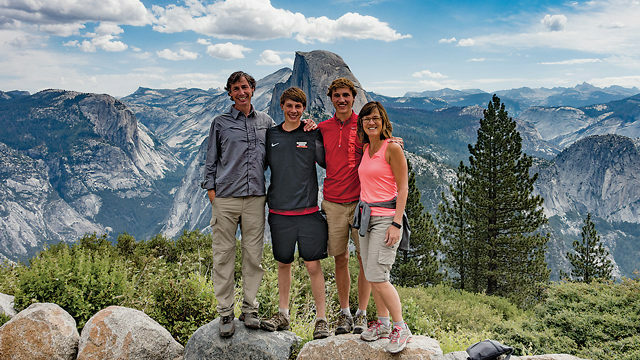 From Glacier Point, we drop down to Yosemite Valley, the park’s other most-visited location. 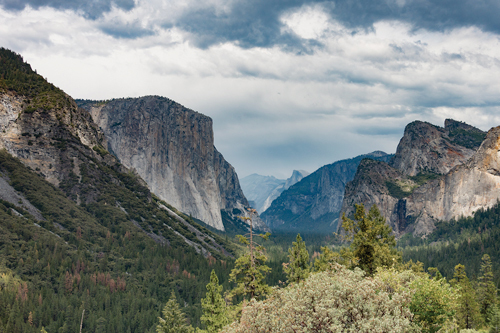 We enter the valley via the mile-long Wawona Tunnel and upon emerging are immediately greeted with the famous valley view dominated by El Capitan, along with long lines of traffic. There’s no sugarcoating the crowds in the valley. They are bad. At Glacier Point, the crowds had room to spread out. But the valley, which is less than a mile wide, has no such dispersement option. But even so, the enclosing walls of the valley are the perfect complement to Glacier Point’s wide-openness. The Merced River stitches a seam through meadows along the valley floor, and sunset mellows the granite towers until they feel more like encircling arms than rocky cliffs. We spend most of the third day exploring Yosemite Valley. Many flat rocks along the valley floor are still marked with the shallow circular holes created from the Ahwahneechee practice of grinding acorn kernels into meal. The heart of this indigenous people’s former land is at the base of Yosemite Falls, which, depending on the water flow, can be either a thunderous torrent or a thin ribbon striping down over 2,400 feet across its three sections. The highlight of the day is an easy bike ride to the head of the valley, from which we hike along the Tenaya Creek to Mirror Lake, so named for the perfect images of surrounding cliffs reflected in its glassy surface. Day four finds us following the Tioga Road up, up, up, into Yosemite’s high country. Our destination is Tuolumne Meadows, a sub-alpine plateau at around 8,600 feet of elevation. Along the way, we stop at Olmsted Point, a viewing area that provides a very different perspective of Yosemite Valley and especially Half-Dome, which seems ever-present these past few days. This high country is still an attraction, but we definitely shed the crowds the farther we venture into the wilder portions of the park, and it is here that Yosemite yields up its more contemplative side. We set out on trails through wildflower fields and alpine forests. The Tuolumne River serves as an ambling guide for the trail, which nudges its stippled banks from time to time. It’s a blissful hike. 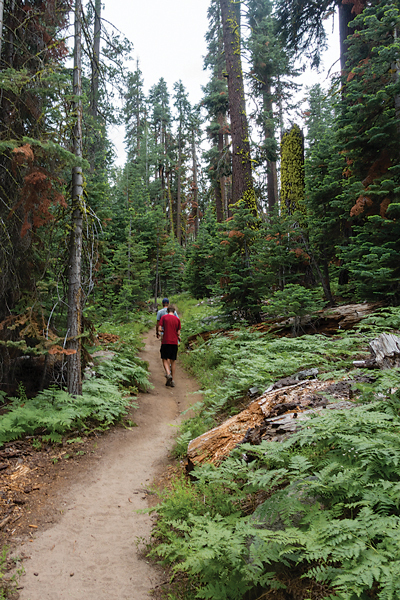 Perhaps it’s the way the trail meanders from thickets of western white pine to meadows laced with purple lupine, or the way distant heights like Mount Dana or Mammoth Peak shimmer across the miles – and yes, there’s probably an assist from altitude-induced oxygen deprivation – but our conversations ramble as widely as the landscape. We find ourselves talking about change, about the excitements and anxieties that accompany Ben moving outward into the world. It’s open and unguarded. 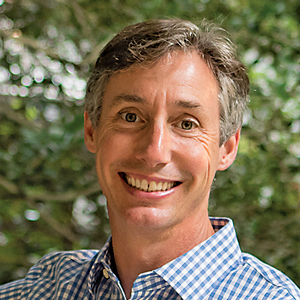 There’s no revelation, just a reassuring sense that we can each be excited and nervous for different reasons, yet share the same faith that we have built the right framework to accommodate all of the changes that life throws at maturing families. Any parent of a teenager knows how brief these moments can be, and sure enough, it’s not long before Ben and Sam start asking the river for strength and lope away ahead. Dena and I continue at our own pace, but even from a distance, we can read the body language of two brothers happily bound together on a high-altitude journey. Our final day in Yosemite will show us yet another side of the park, as we head to Hetch Hetchy, one of the park’s least-visited areas. 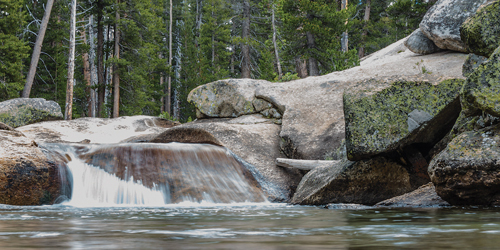 From its origins in Tuolumne Meadows, the Tuolumne River flows east, through the Grand Canyon of the Tuolumne, and into what is now Hetch Hetchy reservoir. The reservoir was formed in 1923 when the construction of the O’Shaughnessy Dam flooded what was then the Hetch Hetchy Valley in order to provide a reliable water source for San Francisco, which lies some four hours south and west of Yosemite. The reservoir was and remains a subject of contention, but in the meantime, it’s fascinating to look out over it and imagine that at one time, it looked like Yosemite Valley does today. We access our hiking trail by crossing the dam, which, controversy or not, is an impressive and somewhat dizzying engineering feat. Past the dam, a tunnel, bored through Yosemite’s ubiquitous granite rock, opens to hiking trails that border the reservoir and provide striking views of the hills and sheer rock faces that rise dramatically from the water’s edge. Hetch Hetchy is, perhaps, a fitting end to our visit. It feels a world away from its sister valley, Yosemite, and even yesterday’s high country feels like a dream. It is hot and dusty here, and it’s hard to imagine that the dark bulk of water before us can be traced directly back to the bright watercourse that meandered through the cool meadows we had hiked the day before. By midday we have returned to the trailhead, and so exit the way we arrived, through the tunnel and across the dam. From there, it was back to San Francisco, an early-morning flight east, returning home where we would soon turn our attention to college. There was packing to do, lists to check off, shopping to complete at Bed Bath & Beyond. And as we went about our business, I kept a photo of one particular tree on my smartphone so I could periodically look at it, and quietly, out of earshot of everyone except for me and my special sequoia, remind it to grant me strength. So, You Want to Go to Yosemite? 1. If you’re flying Just know there are no airports close to Yosemite. We flew into San Francisco for cost and convenience purposes, but it’s a four-hour drive to Yosemite. Other airports like Fresno are closer (two hours), but less convenient and often more expensive. 2. Pick the season that’s right for you Summer, as mentioned, is crowded, but the entire park is open and accessible. From late fall through spring, the park is less crowded, but snow closes some of the higher-elevation areas, especially the Tioga Pass in the northeastern section of the park. 3. If you plan to stay in the park Investigate in advance and know your options. There are several hotels in Yosemite Valley, and a number of other options in the park, ranging from backcountry camping to tent cabins. A good overview, with links to additional resources, can be found at nps.gov. There are also a number of lodging options located just outside the park. We particularly enjoyed the Evergreen Lodge (evergreenlodge.com), which offers both camping and cabin accommodations, as well as a wide variety of activities and dining options. 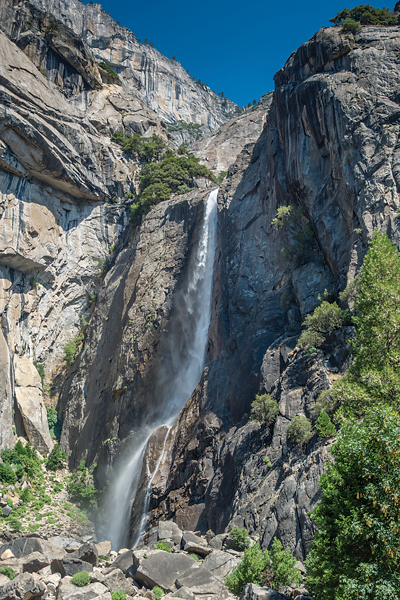 TripAdvisor has good information and reviews of lodging in and around Yosemite. 4. Self-guided or hired guide? Much of Yosemite is easily accessible to both experienced and inexperienced adventurers (although venturing into the back country is best left to those who know what they are doing), so guides are not necessary for navigating a Yosemite trip successfully. However, guides can enhance the experience. Knowledgable naturalists can turn a walk in the woods into a full-immersion classroom. Operators, such as Backroads (backroads.com) or Lasting Adventures (lastingadventures.com) offer everything from guided day hikes to fully-supported multi-day excursions into the heart of Yosemite. 5. About biking We biked through the Yosemite Valley on paved bike paths, and it was a good way to beat the traffic on the roads. However, the park’s roads are narrow and windy and treacherous for cyclists. Mountain biking is not permitted in Yosemite. 6. And a note about altitude Terrain in the park ranges from roughly 2,000 feet above sea level to altitudes in excess of 10,000 feet. People generally begin to experience altitude sickness above 8,000 feet, so be aware and take proper precautions if you are prone to altitude sickness. That being said, we spent a day of moderately strenuous hiking in Tuolumne Meadows with no ill effects. It’s probably best, if you have a few days, to visit the higher elevations later in your trip.